The first book in the acclaimed and award-winning New York Times bestselling trilogy. 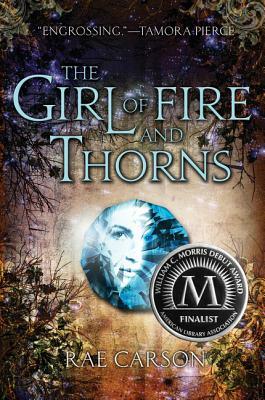 The Girl of Fire and Thorns is a remarkable novel full of adventure, sorcery, heartbreak, and power. Once a century, one person is chosen for greatness. Elisa is the chosen one. But she is also the younger of two princesses. The one who has never done anything remarkable, and can't see how she ever will. Now, on her sixteenth birthday, she has become the secret wife of a handsome and worldly king—a king whose country is in turmoil. A king who needs her to be the chosen one, not a failure of a princess. And he's not the only one who seeks her. Savage enemies, seething with dark magic, are hunting her. A daring, determined revolutionary thinks she could be his people's savior. Soon it is not just her life, but her very heart that is at stake. Elisa could be everything to those who need her most. If the prophecy is fulfilled. If she finds the power deep within herself. If she doesn't die young. Most of the chosen do.